Hi everyone. 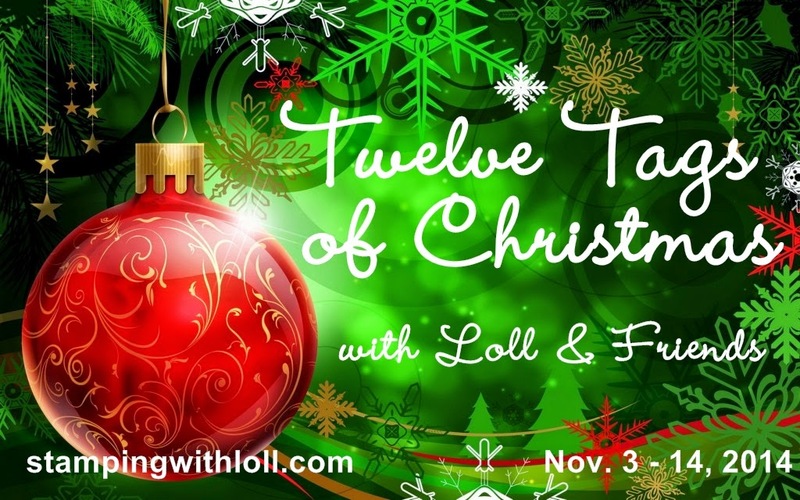 Welcome to Day Nine of my "Twelve Tags of Christmas" Event. Each day, for twelve days, I'm posting two mixed media Christmas tags (one made by me; one made by a friend). We hope our tags inspire you! And for more inspiration, please check out the tags that have been entered ... lots of gorgeousness in the gallery! And if you haven't already done so, come join in the fun and link up your Mixed Media* Christmas tags below. Faux-mother-of-pearl technique (click HERE to see my video tutorial) was used on the tag (2 1/8" x 3 5/8") and then it was sponged with two distress inks (Weathered Wood and Black Soot). The trees were stamped a few times in Smoky Slate ink (SU! ), one is second generation for the background. 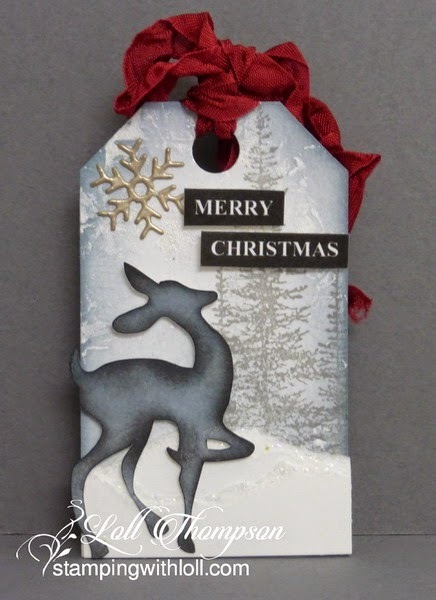 The deer is cut with the Cameo and sponged the same colors as the tag (Weathered Wood and Black Soot), and the snowflake is a die-cut, covered with Versamark ink, coated in Liquid Platinum embossing powder and heated ... such a beautiful color! The sentiment is computer generated onto white card stock and then cut out. For the snow, white card stock was ripped and layered, with clear glitter glue brushed along the ripped edges for some sparkle. Cherry Cobbler seam binding was misted with water, scrunched and left to dry ... then tied to the top of the tag. The red adds a nice pop of color against all the gray. Today's special Guest Designer is Julia ... another wonderful crafter I met through SCS (Splitcoast Stampers). I was drawn to her style of card making, and checked out her blog, Create with Me. Julia makes many styles of cards, but has totally embraced the mixed media style (a la Tim Holtz), using incredible techniques from his instruction books. Julia’s mixed media tags are STUNNING … I always gasp when I see them on her blog ... amazing! Hope you'll take some time to look through her blog ... you'll be glad you did! Julia is currently on the design teams for Creations by AR and Waltzingmouse Stamps … and is on the design teams for Mixed Media Card Challenge, Fusion Challenge, and A Vintage Journey Challenge. For details on how Julia made this gorgeous tag below, please click HERE. Fabulous tag Julia ... thank you! So excited and happy to be sharing the 'tag' stage with you today Loll! There have been so many wonderful tags so far and I'm sure several more days of the same are coming - thank you so much for inviting me along! I had lots of fun creating my tag for today! I love your beautiful smokey deer in the winter forest on your tag! I Love your grey and white color combo Loll with a splash of red for your ribbon. Gorgeous die cut deer with your beautiful winter scene background. Loll your tag is absolutely stunning today. Fabulous use of colors sets such a peaceful stage! Loll, I am so enjoying the 12 days of tags. Inspiration galore . . . from so many creative crafters! May try one - never submitted anything before! Oh I have no favorite - all are beautiful and unique. But, this one with the grey and white is a breath of fresh air - love it. Wow! The gray would have scared me but it worked beautifully! The pop of the red ribbon finishes it off beautifully! Both tags are wonderful! Love the contrast of white/grey with the red ribbon! Gorgeous! WOW! Love the colour combo on this one Loll, the grey and white look so wintry and the splash of red gives a real festive feel. I love the soft gray of this tag contrasting with the pop of red. Lovely scene. Two gorgeous tags today! Loll, I love your soft colour scheme - it goes perfectly with the deer. And Julia's card is a wonderful example of mixed media - I'm off to her blog to see how she did it. Such pretty tags! So festive and inspiring! Loll, I love your soft colour scheme - it goes perfectly with the deer. And Julia's card is a wonderful example of mixed media --- I love the snowy letters and all of the different elements she used! Two more stunning examples of the beauty of mixed media. From the colours, to the images, to the textures, to the dimension, these are wonderful works of art. I wish you were having more than 12 days , because I am so inspired by all this wonderful creativity! Todays tags are both stunning! I love the beautiful colours in your tag Loll and Julia's tag is mixed media perfection! Beautiful tag, Loll! I love the soft background and the elegant deer. Julia's festive vintage tag is fabulous!